Xanax is the brand name of a prescription benzodiazepine medication, which is also available under its generic name alprazolam. This short-acting sedative is prescribed to treat general anxiety disorder (GAD), anxiety associated with depression, and panic disorder. Although it may be used off-label for depression or insomnia, Xanax is not typically used to treat alcohol use disorder or seizure disorders as other benzodiazepines may be prescribed. 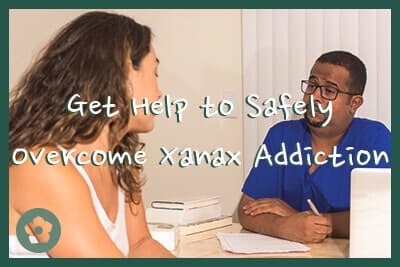 Because Xanax is a potent prescription medication that acts quickly, it has many risks and can interact with numerous drugs, including opioids and alcohol. A recent study found that, in 2013, benzodiazepine medications were involved in 30 percent of overdose deaths, second only to opioid drugs, which were involved in 70 percent of overdose deaths in the United States. Between 1999 and 2013, the number of prescriptions for this class of sedatives, including Xanax, doubled. These prescription substances are widely available in households across the country. Since they are widely available, they are more likely to be abused. Xanax takes effect on the brain in about one hour and has a half-life of about 11.2 hours. People who abuse this drug may take it orally, as it is intended when the drug is prescribed, or they may crush pills to snort them or inject the substance intravenously to induce a much more rapid and dangerous high. Abusing Xanax through any method is dangerous and has severe physical and mental consequences. Side effects from drug abuse can indicate whether a loved one is suffering and needs help. A person who struggles with addiction to Xanax will suffer consequences in all areas of their life. They may overdose and be hospitalized; they may suffer chronic health problems like muscle weakness, memory loss, and learning or mood problems; they will begin to show disinterest in life, especially at school or work; they may perform poorly at school or work, leading to academic consequences, failed classes, or lost job; they will suffer other financial consequences because they spend too much money on the drug; they may gain weight because of lethargy or lose weight because they stop eating; they may lack energy or motivation, which could be uncharacteristic of them; they may become aggressive, sad, or defensive when questioned about their drug habits, or they may lie about the substance; they may neglect their appearance and stop showering, washing their clothes, or performing other grooming habits. A person’s body develops a tolerance to benzodiazepines within six weeks of consistent use, and many of these drugs, like Xanax, lead to tolerance in a month or less. Pharmacists and psychiatrists typically prescribe these medications for “as-needed” use, so they are not taken consistently. People who struggle with anxiety are at risk of feeling dependent on anti-anxiety drugs like Xanax to suppress panic attacks or stress, so it is important to take Xanax only as directed and work with a therapist. Unfortunately, many people may abuse these drugs without supervision from medical professionals, which can cause serious harm. Withdrawal symptoms associated with Xanax and other benzodiazepines can also be dangerous. Hallucinations, delirium, and seizures are risks associated with abusing a lot of Xanax for a long time. 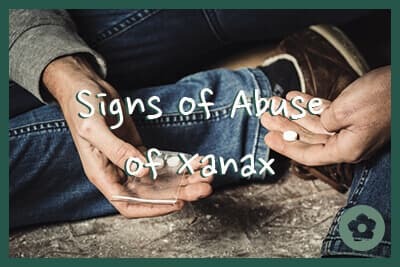 Even in people who have not abused that much Xanax but still struggle with addiction to the drug, withdrawal can be uncomfortable, and without help, it can trigger a relapse. Professional help is needed to safely stop abusing Xanax, and withdrawal should be followed by comprehensive therapy.